Until now, your nawmal 3D scene comprised the set and the actors. The latest version nawmalMAKE introduces a collection of 3D objects (props) that you can use in your scene.Once added to the scene, you can position, rotate and a new feature, SCALE the objects. Here, Independent Learning Consultant Allyson Benavides explains why using nawmal videos is so powerful. Each of these videos was created and completed in less than 5 hours. 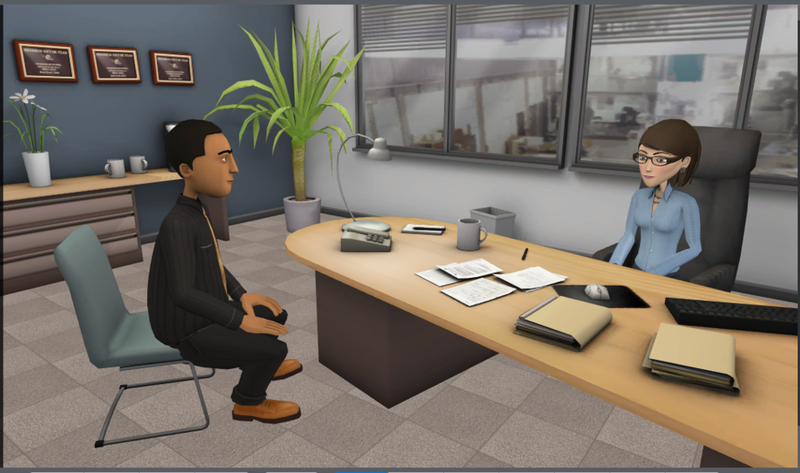 Scenario-based training is a powerful way to quickly connect with your learners', especially when creating soft-skills learning - such as Leadership and Sales training courses. Using video to tell your story is the most effective way to engage learners and connect with their emotions. Accurately depicting human interactions helps your learners to visualize, engage and understand your scenario; for example, showing how to conduct a performance review or have a difficult conversation with a team member. We have a few updated sets available for you to use. These updated versions have a new, more neutral color-scheme, more contemporary styling, with wood flooring and flat-screen monitors on the desks. The New Private Office also includes a "fix" to improve the shadows on the floor. We've also added or improved the shadows on the floors of the Coffee Area and the Private Office - Night sets. If you have created a scene using the Boardroom, Coffee Area or Private Office - Night set, it will update automatically to the new version when you re-open that project file. It's a pretty straight forward process if you have already created a project using the Open Office or Private Office - Day set, and want to update your scene to use the new, modernized versions. In the Locations view, click [Change..], then select the new set where you want your scene to take place - the updated version of the set, then when the "Custom camera angles will need updates" pop-up appears (see below), click [OK], and your existing scene will now take place in the new set. 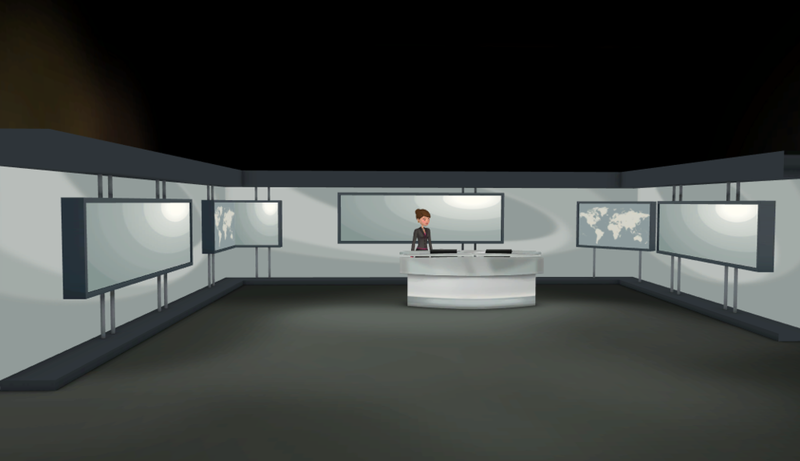 To round of the new collection of sets, there is a new, alternative TV set. Again, more contemporary, and with a selection of screens more appropriately sized for the scale of the characters. In this set, all the walls and screens are inlays, so that you can decorate in your desired color-scheme, and incorporate your images on any or all of the screens. To help you customize this set, below is information for the aspect ratio and optimal pixel resolution for each of the inlay screens available in the scene. The world of training technology isn’t changing...it has changed. You’ve already noticed that your learners are losing patience with PowerPoint presentations, possess increasingly diminishing attention spans and want everything they can possibly get on their smartphones. You may already be using video in some ways to enhance your training. To standardize the on-boarding process, provide live product demonstrations or encourage social learning, among other things. But if you really want to scale your training, and keep up with demands that are growing on a budget that is not, it’s time to think about professional quality animated video. You may not want or need to use video everywhere, but here are five ways you can get started. An introduction video is a great way to focus your learners’ attention. By using animated storytelling, you can get their attention and orientate them to what they will encounter in the course, letting them know what is expected of them. A one- or two-minute orientation video can have a big impact on the entire course. Characters in videos are a great way to accompany your audience through a process that might otherwise be difficult. The characters can lay out the steps and encourage them, or help them, complete what’s required. A very creative (and effective) way to use animation in video is to visually explain something that might otherwise be complex or boring. If you have a lot of information to deliver, consider adding in a character to “personally” present it to your learners. Animated video characters have come a long way... you might be surprised how much subtlety and emotion they can express. If you need to present scenarios in your training, you don’t need to pay for actors and studio time to do it right. You can use animated characters to demonstrate any scenario. You’ve certainly heard the buzz about VR360 and AR in training and you may be thinking that’s something for the future. Well, the future is now and if you want to turn engagement in your training up to 100%, you can use nawmal tools to create your own VR360 & AR videos. Put your learners right into a virtual reality scene, so they can not only watch the story but be a part of it... first hand. Instead of explaining how to do something, you can have them practice doing it themselves for much greater retention. And it can be done quickly and for a fraction of the cost of live, plain old reality videos. There's no need to wait to start using animated video in your training SIGN UP HERE to learn more about nawmalMAKE. Thank you for signing up, you can download a little more information about nawmalMAKE by clicking here. You’ll receive immediate access to a nawmalMAKE information sheet, and updates as they happen! This feature is used too little and yet it can be really useful. The Automatic Cinematography feature allows you to sit back and relax while the software takes care of “filming” your characters: taking care of selecting the camera angles and cutting between them to give you an edited movie - automatically. We use it to quickly create a finished video: just type the dialogue and press play; and also to suggest ideas – sometimes the result may not be exactly what you want, but it can show different options, including things you might not have thought of. Before you check the box. WAIT! This feature works best if your characters are placed on the First and Second Positions. When adding a character into the scene, you will notice that the “Position Task Bar” will open. When selecting First or Second, it aligns the character with the pre-set cameras in the scene. If your characters are already in the scene and your “Position Task Bar” has disappeared, don’t panic. Click on your characters’ picture and it will appear. Once your characters are on their positions, check the automatic cinematography box and enjoy the show! Have you ever wondered how to use the colourful Cyclorama, the gridded Holodeck, the flashy Green Screen, the Presentation and the oh-so-very-white White sets? Follow the guidelines below to make the most out of the Backdrops Collection. As colourful as the Cyclorama may seem, it’s purpose is not to be a cotton candy look-alike set. In fact, in the cyclorama set, you can import your own panorama pictures to personalize your characters’ environment. The 6 screens, filled with different colors, are customizable and of different sizes. To create the picture below, we cut one image in 3 to put the 1/3 of the picture on the Ceiling screen, 1/3 of the picture on the Floor screen and 1/3 of the picture on the Wall 01 screen. The holodeck provides a neutral background you can use when wanting to concentrate on the characters’ text or speech instead of décor. The Green Screen makes it simple to import your video in a movie editing tool and add the background you want. Our favorite editing tools are Camtasia, Final Cut Pro, Sony Vegas and PowerDirector. The “screen” in the presentation set perfectly aligns with Camera 1, so that the image completely fills the frame. This is ideal for putting your character in front of an image, or for presenting a video or a PowerPoint for example. The white set is a 6-screen box. You can import 6 different images or videos.